Once again the Jokers of Doom found themselves being out shot in a game, this time by the hefty margin of 29-13. However as in many other games this season, they found a way to win versus the Vipers. Ken Herren opened the scoring at 3:12 by sliding in a backhander into a wide open net after a brief scramble in front, assisted by linemates Garrett Salkins and Frank Melillo. The period would end with a 1-0 lead on the scoreboard and an 11-5 deficit in shots. In the second Josh Berrelli made it 2-0 after picking up a rebound and lofting a back hand flip past ex-Joker goalie Fernando Gomez, assisted by linemates Jim Brunetti and Kevin LaPrade. The Vipers however would get on the board before the period ended as John Venditti would blast home a long shot at 4:47. Once again the period would end tied 1-1 in goals but behind in shots 9-5. Things got more interesting in the 3rd period as there would be 3 penalties and 3 goals scored. Just 35 seconds in LaPrade would again find the scoresheet, slamming home a quick blast between the circles on a feed from Berrelli. Only 38 seconds later a wide open Jeff Condel would whip home a wrist shot to make it 3-2 and increase the pressure. LaPrade would once again bust through with a goal on a quick shot from 10 feet in front on a rebound of a shot by G. Salkins. The Vipers could not get another past Jokers goalie Matt Dutily, who came up huge many times especially in the first period and again in the final 6+ minutes. The Jokers will now move on the best of 3 finals in D division with game 1 Saturday at 1:00pm at the Plainville Arena against the Hurricanes, who upset top seed Springfield Chiefs 7-3. They are 1-1 versus the Hurricanes this season, winning 3-2 on December 13, and losing 6-5 on January 31. It has the makings of a 3 game battle. 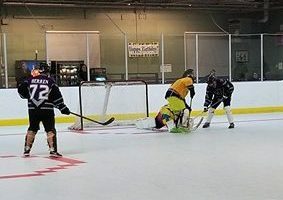 Notes: Jokers scored two goals on three shots in the third period… Final shot total Vipers 29, Jokers 13… Injured goalie Andy Pettola (achilles) was present on the bench rooting on his team. The Jokers of Doom came into Friday evening’s contest with Chaos off of a tough 6-5 loss to the Hurricanes which was also 2 losses in their last 3 games. They needed a win to get back on track and secure their playoff standing. As per the norm, the Jokers don’t like to take early leads so in the first period Nick LaChance from Chaos scooped up a loose ball in the offensive zone, made a quick move and fired a wrist shot past Joker’s goalie Matt Dutily. Luckily the Joker’s like to make comebacks and only 1 minute and 22 seconds later Garrett Salkins fought hard for the ball in the corner, took control and glided to the side of the net and lifted a pretty backhander into the top of the net to make it 1-1. Then with just over a minute left in the period Ken Herren took a pass between the circles from Josh Berrelli and attempted to fire one high on the goalie but a Chaos defender deflected the shot sending it high in the air where seconds later it would bounce behind the net minder and into the goal giving the lucky Jokers a 2-1 lead heading to the second. In the second period both teams would exchange one goal with Berrelli notching his 5th goal of the season stuffing in a nice backhand pass from Herren and ex-Joker defenseman Devon Sylvester getting his 5th on a long slap shot. The final period would see a lot of back and forth action and a few good scoring opportunities but no one could find pay dirt as both goalies made all the key saves. Chaos pulled the goalie for the final couple of minutes and the ball bounced perilously close to the side of the goal in the closing seconds but the Jokers kept LaChance and Chaos off the scoreboard to hold on to the 3-2 win. Notes: Frank Melillo was a late scratch… Jokers were out shot again 28-27 and have been out shot in every game this season however their 202 overall shots is 3rd in the division… Herren now holds a 2 point lead in the race for the scoring title with 17 points… Jokers were 0-3 on the power play including a 2:00 penalty they couldn’t cash in on remaining at 1 pp goal for the season. The high of the Jokers win in their last game 7-3 over Hockey Balboa would be short lived. They came into their matchup with the Hurricanes short handed as Garrett Salkins, Kevin LaPrade, and John Condit would all miss the contest. The first period would see 3 goals and 19 shots between the two teams. The Jokers would have their only lead of the game on the first goal, a quick wrister by defenseman Rich Orsini that found the 5 hole. Unfortunately the Hurricanes would crack the scoreboard a couple of minutes after Orsini’s goal to tie it and added another goal in the final minute to take a 2-1 lead into the second. In the second period again the Jokers would score first on a breakaway goal by Josh Berrelli, assisted by Paul Bellantuono (the first of this 3 assist night). Once again the Hurricanes responded with 2 goals to push the lead to 4-2 after two. The 3rd period would start this time with the Hurricanes scoring their 3rd consecutive goal. just 53 seconds in. At that point things were looking grim for the Jokers as Berrelli would have to leave the game to prepare for his goalie appearance in the very next game. Even with these odds against them the Jokers showed some fight with 2 consecutive goals by Ken Herren and Frank Melillo to make it 5-4. Herren would score on a slap shot after a face-off win and Melillo would bang home a rebound after a shot by Herren again after a face-off win. In the end it would not be enough, the Jokers pulled goalie Matt Dutily but the Canes would put in an empty netter to seal it, although Jim Brunetti found pay-dirt on a quick wrister on a pass from the side boards by Melillo to again pull within 1 goal but could not get the equalizer before time expired. Overall a great comeback effort that fell a bit short. The Jokers are still in solid position at 5-3 and second place in the division, with a big game against 3rd place Chaos (4-2-1) coming up next week. Notes: Jokers were out shot again in this one, 34-25… With 1 goal and 1 assist, Herren retains the division scoring lead with 15 points… Game featured no penalties… Berrelli hit the post on first period breakaway… Orsini leads all Jokers defensman with 7 points (2 G, 5 A)… next game Friday February 9 at 8:00pm versus Chaos. The Jokers of Doom got back on track Wednesday evening with a rousing 7-3 win over Hockey Balboa, their 2nd win vs them this season after an opening game 4-3 victory. In this game the Jokers returned to a full squad and had Matt Dutily as the backstop, allowing Josh Berrelli to return to his forward position where offense was desperately needed after last game’s 5-1 loss to the Springfield Chiefs. It wouldn’t take long for the offense to get going as Ken Herren took a pass from Garrett Salkins behind the net and stuffed it in off the goalie’s glove just 29 seconds into the game. Herren would also nab a second goal (power play) on a quick slap shot from the left circle after a nice backhand feed from defenseman Paul Bellantuono. It was looking like the Jokers would carry a somewhat comfortable 2-0 lead into the second period until Glenn Diaz fired home a point slap shot with only 18.9 seconds left in the period. This is where the speedy Berrelli makes his offensive impact felt as he scooped up a loose ball in his own zone and raced down the rink and fired in a wicked wrist shot milliseconds before the buzzer ended the period. Hockey Balboa team members would argue the goal came after the buzzer, but the decision was finalized as a good goal and a 3-1 lead. The Jokers would carry this momentum into the second by scoring the next three goals, two from G. Salkins including an unassisted beauty after a steal and the third goal of the game for Herren, snapping in a Berrelli rebound. After those goals created a 6-1 lead the Jokers went into cruise control a bit and defensive lapses led to two Balboa goals late in the period making it 6-3 heading to the third. The third period featured a lot of back and forth action but only one goal as Berrelli would net his second of the game on a breakaway after a great pass from Jim Salkins, his first assist of the season. That goal would take the steam out of any thoughts of a comeback and the Jokers would hold on to the 7-3 victory. Notes: Jokers (5-2) are 2-0 vs Hockey Balboa this season while outscoring them 11-6… Herren’s four-point night gives him the overall division lead in points with 13 (8 G, 5 A)… SOG were even at 22 per team… Dutily (2.50 GAA in his two starts) made 19 saves, including several key blocks during the first period… Jokers collected their second power play goal of the season… next game Wednesday evening vs Hurricanes (3-4). The Jokers of Doom received some terrible news prior to their Saturday matinee against co-division leaders Springfield Chiefs. 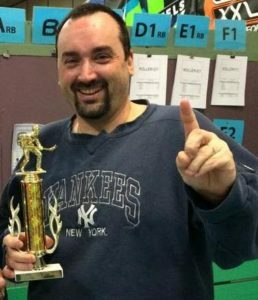 Captain/GM Jim Brunetti announced that goalie Andy Pettola was lost for the season after suffering a torn Achilles tendon while playing basketball. To make matters worse, primary backup Matt Dutily was unavailable for the key division battle. Luckily the Jokers had another player with goalie experience on the roster in Josh Berrelli, whose last known appearance in net for the Jokers was during the summer 2016 season. Early on Berrelli was up to the task with a solid first period that saw a handful of good scoring chances for each side. The period also featured a few scuffles as both teams tried to get on top early. In the end the period would result in a 0-0 tie headed into the second. In the second, the Chiefs continued to press and found pay dirt with a goal about 1/2 way through the period during a scramble in front of the net after an initial save on a close shot. 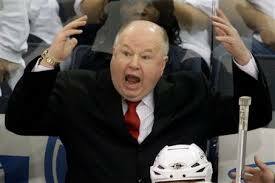 The Chiefs would add another goal later in the period and no further scoring would occur resulting in a 2-0 deficit. Finally, in the third period the Jokers still couldn’t find their offensive mojo, which again was made worse by top winger Garrett Salkins not playing the entire period due to illness. The Chiefs would add a 3rd goal before the Jokers finally found the score sheet as Kevin LaPrade blasted home a feed between the circles from Ken Herren to make it 3-1. The momentum would be very brief as the Chiefs quickly responded with another goal approximately 7 seconds later, ending any thoughts of a comeback. Later they would add a 5th goal to close it out. The loss leaves the Jokers at 4-2 and in second place, 2 points behind the Springfield Chiefs and 1 point ahead of Chaos (3-2-1). Notes: The Jokers were out-shot 23-20, with Berrelli making 18 saves… Also missing the game were stalwart defensemen Jim Salkins, Paul Bellantuono, and Tom Condit… Defenseman Mike Bradigo made his second appearance of the season and logged 28 minutes played alongside line-mate Rich Orsini… “No Comment”, was the reply from GM Brunetti when asked if Pettola had a “no basketball” clause in his contact…. next game Wednesday 1/24 vs Hockey Balboa (2-4), whom the Jokers defeated 4-3 in the first game this season. The Jokers of Doom came into Wednesday night’s tilt with the Vipers coming off of a bitter 2-1 loss to the Tomahawks which snapping a 3 game win streak. This game saw the return of the father/son Salkins duo and the impact was high. Richie Orsini started the festivities with his first goal of the season with a quick wrist shot that found pay dirt stick side low on ex-Joker goalie Fernando Gomez assisted by Garrett Salkins and Kevin LaPrade. Orsin’s goal would end up being the game-winner as Andy Pettola bounced back with a stellar 28-save shutout. The first period would also feature a G. Salkins goal after a Viper turnover and a couple of shifty moves in front of the net. Josh Berrelli would add a score later in the period assisted by Ken Herren and Jim Brunetti. The second period featured only one goal, a backhanded flip in on a 2-1 breakout by Herren on a sweet feed from Berrelli past the lone defenseman. In the third period the Jokers would tack on three more goals from Brunetti, as well as Berrelli, and G. Salkins with their second each of the game. Throughout the game, both teams questioned the officials’ judgement on penalties, icings, and face off locations. Notes: Berrelli made his rare presence felt with two goals and two assists… Pettola is now 3-1 and leads the division with 1.75 GAA and 93.5% save percentage… Frank Mellilo and John Condit missed the game for undisclosed reasons… Herren (1g,1a) now tied for league lead in goals (5) and points (8)… Jokers tripled their season PIM with three penalties in the game… next contest: Saturday January 20 vs Springfield Chiefs.